Instead of installing an entirely new staircase in your Cambridgeshire home, why not simply update your existing staircase with a selection from Pear Stairs' wide range of stair parts? Choose from our collection of handrails, newel posts and newel caps which will instantly give your stairway a fresh look and a distinct style. Stair handrails are a subtle, yet efective way of accessorising your staircase. If you’re looking to create a staircase that even the Duchess of Cambridge would be envious of, your banister can be enhanced by a continuous handrail and decorative volute housed by a curtail step at the bottom of your stairway. This simple embellishment will ensure that your staircase makes an immediate and dramatic impact. To further personalise your staircase, you can enhance your balustrade with newel posts and newel caps from our Cambrideshire stair parts range. Newel posts are the pillars of a staircase balustrade. At Pear Stairs, our newel posts are tailored to accommodate the needs of each individual customer, whether they be in Cambridge in Cambridgeshire or Canterbury in Kent. We cater to all tastes, so you are sure to find newel posts to match both the tone of your staircase and hallway and your own personal style. 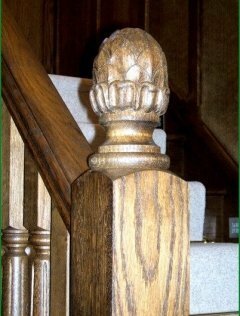 Newel caps are an attractive addition to the newel posts of a stairway. As well as traditional wooden newel caps, hand carved caps and metal styles are also available. Hand carved newel caps, along with other stair parts, subtly add to the individuality of your staircase, making it a truly unique centrepiece, while contemporary metal newel caps give staircases a modern feel. At Pear Stairs, our staircases and stair parts are crafted out of timbers of the highest quality. We work hard with customers from across the UK, including Cambridgeshire, to fulil their staircase needs. 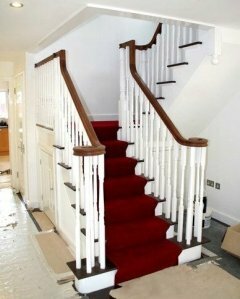 From the first time you approach Pear Stairs, to the moment your staircase or stair parts are delivered to your Cambridge doorstep, our dedicated team will be on hand to help. continuous handrail, crafted from sapele. staircase it is a part of.